Now the next day . . . the chief priests and Pharisees came together with Pilate, saying, “Sir, we remember that while he was still alive that deceiver said, ‘After three days I will rise again’ . Command therefore that the sepulchre be made secure until the third day…” Pilate said to them, ‘You have a watch: go your way, make it as secure as you can.” (Matthew 27: 62-65). 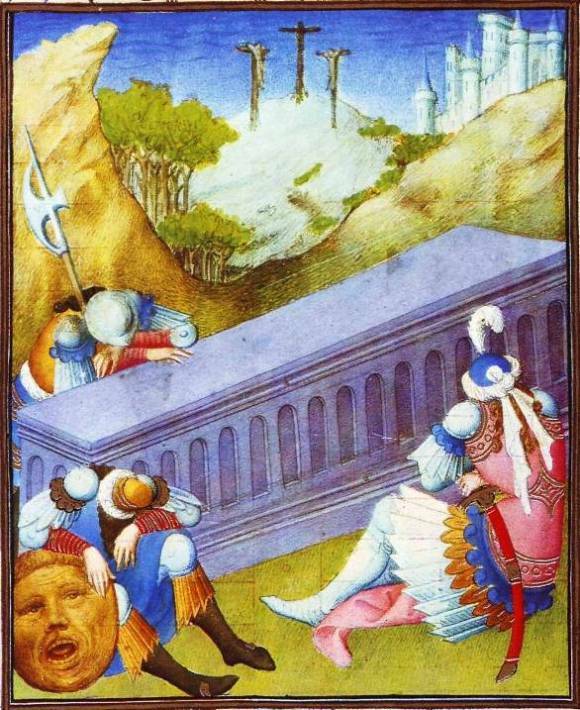 the third guard, armed with a battle-axe, sleeps with his hand on the lid. The artist has painted a deep landscape. Trees rise from the hills beyond the barren foreground. The ancient city of Jerusalem dominates the heights to the right, and against the horizon the grotesquely twisted bodies of the thieves still hang on their crosses on the distant Mount Calvary. Incidentally, this is one of the earliest examples of a sky streaked with clouds.